The SVG background will be transparent but until you place it over something other than white it will look like it has a white background. 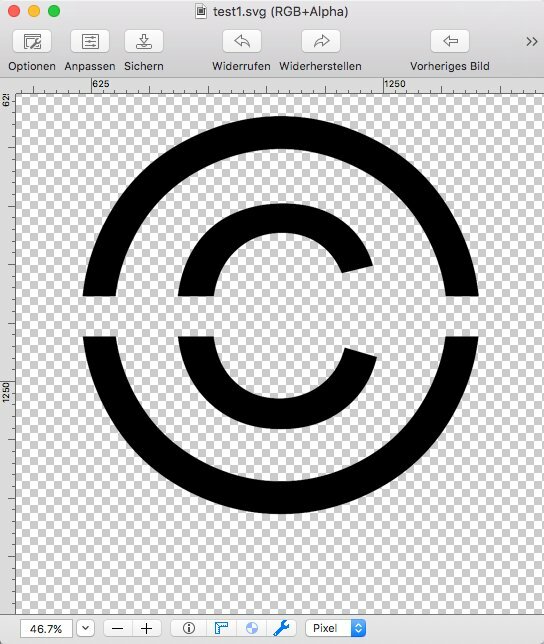 Its not clear whether the rectangle is there as part of the image or there as an example, after all there are neater ways to make that image and why would you cut a copyright symbol in half? doesn't really make much sense at the moment, this is why I have asked what he is trying to do. It's because the rectangle is set to Erase which is forcing rasterization and placing a white background on export . Not so much. I've attached an example that I created, and did not set any special blend mode, just left it at Normal. 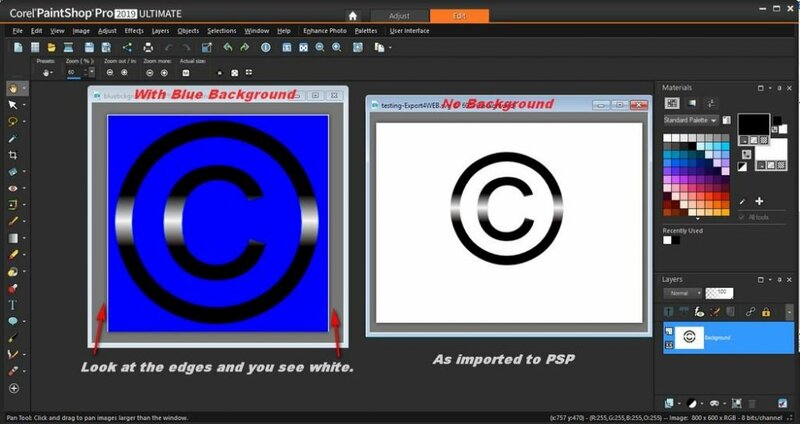 The screenshot is how Paintshop Pro sees it. So far I'm finding the Affinity Photo is the only app that maintains the transparency. The image on the left with the blue background, I intentionally miss-cropped it to see if a white background is applied. 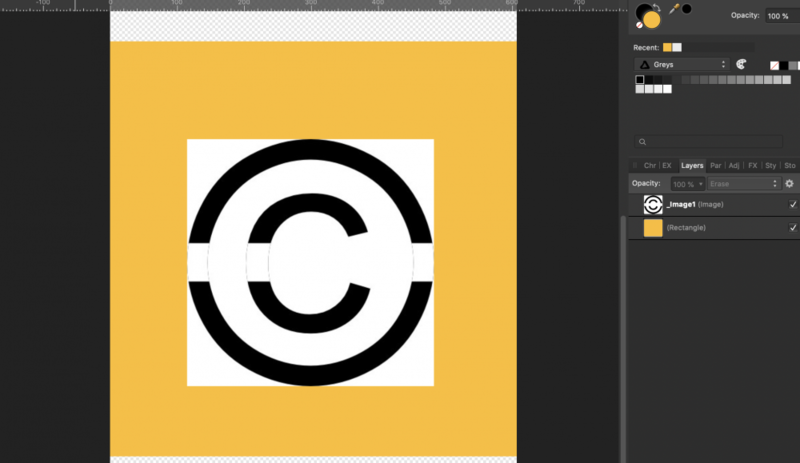 Also for my example I used a gradient fill for the rectangle, Clipped it to the copyright text. @Ron P. I'm not sure what your point is. In Affinity the Erase blend mode causes rasterization. If you don't use it you get transparency, which is expected. Which is what you got. The white edges in your left example are a different issue most likely do to a canvas size/crop in Designer that doesn't have whole pixel dimensions. So that also is expected. A pita, but expected . I was trying to see why the OP was having the problem. Using PSP was probably the wrong program to use, as it does not see it as with a transparent background. I just tried CorelDraw, and the transparency is maintained. PhotoPaint rejects SVG files. Of course I understand that for an object/image to be viewed like on the web or in a photo viewing app, there must be some background color, commonly white. 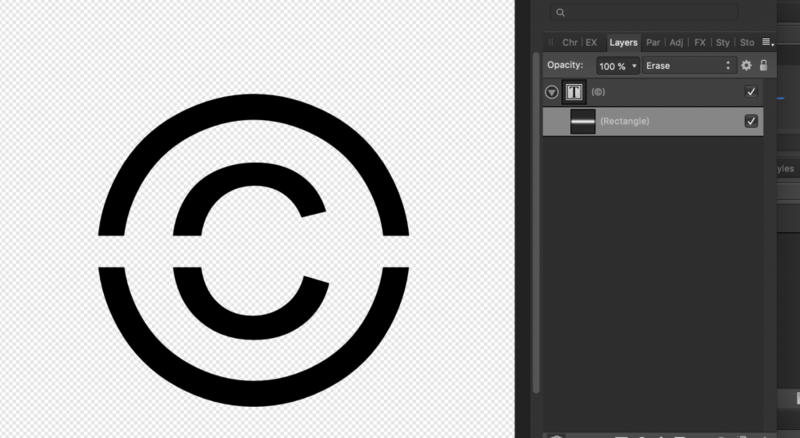 I'm trying to create some text for a logo which is "cut through" with a line or other shapes to expose whatever background is underneath. Same issue when converted to curves. Besides at this stage of the project it's best to keep to text as the font may need to change. If so you can create a Compound shape Layer > Create Compound This will export with Transparency and the text in the afdesign file will remain as text. In Affinity Photo I don't think its possible to mask out parts of text and still keep that text editable, you would have to convert the text to curves, select all the letters and Geometry Add them together to create a single curve and then Geometry subtract whatever shape you wanted from the text curve. Compound subtract is a good idea! But you can use masking instead if you want. The process would be the same in Designer and Photo. It just needs to look like something along these lines. You can create a subtraction Compound in AP which will maintain the text object as text. Select the text and the rectangle then opt-click on Layer > Geometry > Subtract. Also, if you add the Geometry buttons to the main toolbar then you can opt-click the Subtract button. ... it's similar for AD. What makes no sense to me is that exporting to SVG or PDF the white background is created. BUT, exporting to .png retains the transparency. I can only think the white background is a bug in the software. 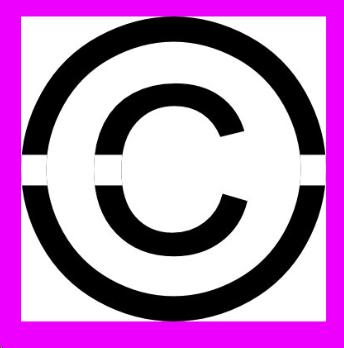 PNG is a raster based file with transparency capabilities, SVG is a vector based file also with transparency capabilities but the addition of the Blend Mode: Erase on the rectangle triggers rasterisation on export and removes transparency capabilities, like it considers it a JPG not a PNG with transparency image. Using Boolean operations on curves maintains the vector status, so, converting the text to curves keeps the transparency option intact. so, converting the text to curves keeps the transparency option intact. 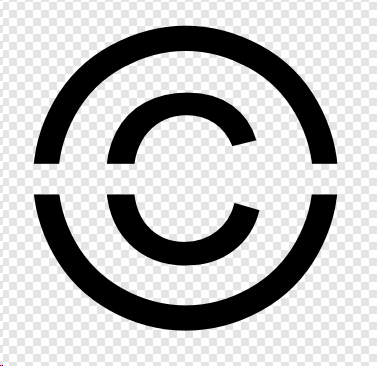 You need to geometry>substract the rectangle from the copyright text. Having what appears to be a white background doesn't necessarily mean it isn't transparent in the area's you want transparency. How are you checking the SVG doesn't have transparency? Simple test, create a new afphoto document and add an orange fill layer. Layer > New Fill Layer This will be used to drag your svg into. If it has transparency you will definitely see the orange, if not it will obviously show white area's where transparency is expected. Just to be clear, you only have Affinity Photo? The only way I can see to get what you want in Affinity Photo is to convert the text to curves and apply boolean(Geometry) operations on the resultant curve. What if you have a word, which is what I think Lucky wants, if you geometry subtract a rectangle from a word it will leave the first letter chopped and the rest will disappear. And designer. I'm getting the same issue with both. How are you opening this svg? As with mine both in designer/photo gave a transparent background and shows as curves. 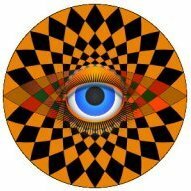 Your layers panel indicates it is an image? Did you also changed the rects erase blend mode to normal? When both are vectors/curves and you select them and make a subtract, you are just leaved with curves/paths. Now if you save that as SVG afterwards make sure to use an app which can show up transparent backgrounds, not all do. Also when exporting as SVG set the more option to NO rasterization should occur then.